Outline map of Greenland with ice sheet depths. GISP2 refers to a main site of the Greenland Ice Sheet Project, where a 3 km (1.9 mi) deep ice core was taken. The presence of ice-rafted sediments in deep-sea cores recovered from northeast Greenland, in the Fram Strait, and south of Greenland indicated the more or less continuous presence of either an ice sheet or ice sheets covering significant parts of Greenland for the last 18 million years. From about 11 million years ago to 10 million years ago, the Greenland Ice Sheet was greatly reduced in size. The Greenland Ice Sheet formed in the middle Miocene by coalescence of ice caps and glaciers. There was an intensification of glaciation during the Late Pliocene. Ice sheet formation occurred in connection to uplift of the West Greenland and East Greenland uplands. The Western and Eastern Greenland mountains constitute passive continental margins that were uplifted in two phases, 10 and 5 million years ago, in the Miocene epoch. [A] Computer modelling shows that the uplift would have enabled glaciation by producing increased orographic precipitation and cooling the surface temperatures. The oldest known ice in the current ice sheet is as old as 1,000,000 years old. The weight of the ice has depressed the central area of Greenland; the bedrock surface is near sea level over most of the interior of Greenland, but mountains occur around the periphery, confining the sheet along its margins. If the ice suddenly disappeared, Greenland would most probably appear as an archipelago, at least until isostasy lifted the land surface above sea level once again. The ice surface reaches its greatest altitude on two north-south elongated domes, or ridges. The southern dome reaches almost 3,000 metres (10,000 ft) at latitudes 63°–65°N; the northern dome reaches about 3,290 metres (10,800 ft) at about latitude 72°N (the fourth highest "summit" of Greenland). The crests of both domes are displaced east of the centre line of Greenland. The unconfined ice sheet does not reach the sea along a broad front anywhere in Greenland, so that no large ice shelves occur. The ice margin just reaches the sea, however, in a region of irregular topography in the area of Melville Bay southeast of Thule. Large outlet glaciers, which are restricted tongues of the ice sheet, move through bordering valleys around the periphery of Greenland to calve off into the ocean, producing the numerous icebergs that sometimes occur in North Atlantic shipping lanes. The best known of these outlet glaciers is Jakobshavn Glacier (Greenlandic: Sermeq Kujalleq), which, at its terminus, flows at speeds of 20 to 22 metres or 66 to 72 feet per day. On the ice sheet, temperatures are generally substantially lower than elsewhere in Greenland. The lowest mean annual temperatures, about −31 °C (−24 °F), occur on the north-central part of the north dome, and temperatures at the crest of the south dome are about −20 °C (−4 °F). Topographic map of Greenland without its ice sheet. The ice sheet, consisting of layers of compressed snow from more than 100,000 years, contains in its ice today's most valuable record of past climates. In the past decades, scientists have drilled ice cores up to 4 kilometres (2.5 mi) deep. Scientists have, using those ice cores, obtained information on (proxies for) temperature, ocean volume, precipitation, chemistry and gas composition of the lower atmosphere, volcanic eruptions, solar variability, sea-surface productivity, desert extent and forest fires. This variety of climatic proxies is greater than in any other natural recorder of climate, such as tree rings or sediment layers. Many scientists who study the ice ablation in Greenland consider that a two or three °C temperature rise would result in a complete melting of Greenland's ice. Positioned in the Arctic, the Greenland ice sheet is especially vulnerable to climate change. Arctic climate is believed to be now rapidly warming and much larger Arctic shrinkage changes are projected. The Greenland Ice Sheet has experienced record melting in recent years since detailed records have been kept and is likely to contribute substantially to sea level rise as well as to possible changes in ocean circulation in the future if this is sustained. The area of the sheet that experiences melting has been argued to have increased by about 16% between 1979 (when measurements started) and 2002 (most recent data). The area of melting in 2002 broke all previous records. The number of glacial earthquakes at the Helheim Glacier and the northwest Greenland glaciers increased substantially between 1993 and 2005. In 2006, estimated monthly changes in the mass of Greenland's ice sheet suggest that it is melting at a rate of about 239 cubic kilometers (57 cu mi) per year. A more recent study, based on reprocessed and improved data between 2003 and 2008, reports an average trend of 195 cubic kilometers (47 cu mi) per year. These measurements came from the US space agency's GRACE (Gravity Recovery and Climate Experiment) satellite, launched in 2002, as reported by BBC. Using data from two ground-observing satellites, ICESAT and ASTER, a study published in Geophysical Research Letters (September 2008) shows that nearly 75 percent of the loss of Greenland's ice can be traced back to small coastal glaciers. If the entire 2,850,000 km3 (684,000 cu mi) of ice were to melt, global sea levels would rise 7.2 m (24 ft), over 14,000 years at current rates of melting. Recently, fears have grown that continued climate change will make the Greenland Ice Sheet cross a threshold where long-term melting of the ice sheet is inevitable. Climate models project that local warming in Greenland will be 3 °C (5 °F) to 9 °C (16 °F) during this century. Ice sheet models project that such a warming would initiate the long-term melting of the ice sheet, leading to a complete melting of the ice sheet (over centuries), resulting in a global sea level rise of about 7 metres (23 ft). Such a rise would inundate almost every major coastal city in the world. How fast the melt would eventually occur is a matter of discussion. According to the IPCC 2001 report, such warming would, if kept from rising further after the 21st Century, result in 1 to 5 meter sea level rise over the next millennium due to Greenland ice sheet melting. Some scientists have cautioned that these rates of melting are overly optimistic as they assume a linear, rather than erratic, progression. 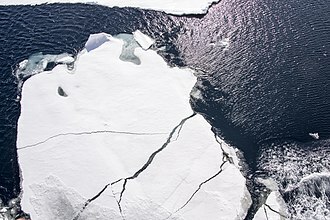 James E. Hansen has argued that multiple positive feedbacks could lead to nonlinear ice sheet disintegration much faster than claimed by the IPCC. According to a 2007 paper, "we find no evidence of millennial lags between forcing and ice sheet response in paleoclimate data. An ice sheet response time of centuries seems probable, and we cannot rule out large changes on decadal time-scales once wide-scale surface melt is underway." In a 2013 study published in Nature, 133 researchers analyzed a Greenland ice core from the Eemian interglacial. They concluded that GIS (Greenland Ice Sheet) had been 8 degrees C warmer than today. Resulting in a thickness decrease of the northwest Greenland ice sheet by 400 ± 250 metres, reaching surface elevations 122,000 years ago of 130 ± 300 metres lower than at present. The melt zone, where summer warmth turns snow and ice into slush and melt ponds of meltwater, has been expanding at an accelerating rate in recent years. When the meltwater seeps down through cracks in the sheet, it accelerates the melting and, in some areas, allows the ice to slide more easily over the bedrock below, speeding its movement to the sea. Besides contributing to global sea level rise, the process adds freshwater to the ocean, which may disturb ocean circulation and thus regional climate. In July 2012, this melt zone extended to 97 percent of the ice cover. Ice cores show that events such as this occur approximately every 150 years on average. The last time a melt this large happened was in 1889. 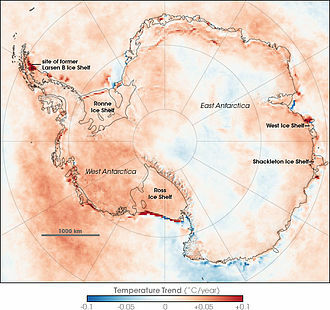 This particular melt may be part of cyclical behavior; however, Lora Koenig, a Goddard glaciologist suggested that "...if we continue to observe melting events like this in upcoming years, it will be worrisome." Global warming is increasing growth of algae on the ice sheet. This darkens the ice causing it to absorb more sunlight and potentially increasing the rate of melting. Meltwater around Greenland may transport nutrients in both dissolved and particulate phases to the ocean. Measurements of the amount of iron in meltwater from the Greenland ice sheet show that extensive melting of the ice sheet might add an amount of this micronutrient to the Atlantic Ocean equivalent to that added by airborne dust. However much of the particles and iron derived from glaciers around Greenland may be trapped within the extensive fjords that surround the island and, unlike the HNLC Southern ocean where iron is an extensive limiting micronutrient, biological production in the North Atlantic is subject only to very spatially and temporally limited periods of iron limitation. Nonetheless high productivity is observed in the immediate vicinity of major marine terminating glaciers around Greenland and this is attributed to meltwater inputs driving the upwelling of seawater rich in macronutrients. The cold blob visible on NASA's global mean temperatures for 2015, the warmest year on record up to 2015 (since 1880) – Colors indicate temperature anomalies (NASA/NOAA; 20 January 2016). Researchers have considered clouds to enhance Greenland ice sheet melt. A study published in Nature in 2013 found that optically thin liquid-bearing clouds extended this July 2012 extreme melt zone, while a Nature Communications study in 2016 suggests that clouds in general enhance Greenland ice sheet's meltwater runoff by more than 30% due to decreased meltwater refreezing in the firn layer at night. 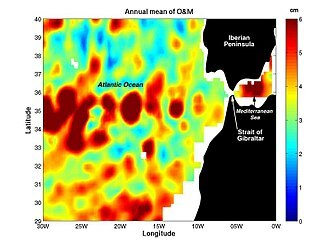 A 2015 study by climate scientists Michael Mann of Penn State and Stefan Rahmstorf from the Potsdam Institute for Climate Impact Research suggests that the observed cold blob in the North Atlantic during years of temperature records is a sign that the Atlantic Ocean's Meridional overturning circulation (AMOC) may be weakening. They published their findings, and concluded that the AMOC circulation shows exceptional slowdown in the last century, and that Greenland melt is a possible contributor. A study published in 2016, by researchers from the University of South Florida, Canada and the Netherlands, used GRACE satellite data to estimate freshwater flux from Greenland. They concluded that freshwater runoff is accelerating, and could eventually cause a disruption of AMOC in the future, which would affect Europe and North America. A 2018 international study found that the fertilizing effect of meltwater around Greenland is highly sensitive to the glacier grounding line depth it is released at. Retreat of Greenland's large marine-terminating glaciers inland will diminish the fertilizing effect of meltwater- even with further large increases in freshwater discharge volume. Between 2000 and 2001: Northern Greenland's Petermann glacier lost 85 square kilometres (33 sq mi) of floating ice. Between 2001 and 2005: Sermeq Kujalleq broke up, losing 93 square kilometres (36 sq mi) and raised awareness worldwide of glacial response to global climate change. July 2008: Researchers monitoring daily satellite images discovered that a 28-square-kilometre (11 sq mi) piece of Petermann broke away. August 2010: A sheet of ice measuring 260 square kilometres (100 sq mi) broke off from the Petermann Glacier. Researchers from the Canadian Ice Service located the calving from NASA satellite images taken on August 5. The images showed that Petermann lost about one-quarter of its 70 km-long (43 mile) floating ice shelf. July 2012: Another large ice sheet twice the area of Manhattan, about 120 square kilometres (46 sq mi), broke away from the Petermann glacier in northern Greenland. In 2015, Jakobshavn Glacier calved an iceberg about 4,600 feet (1,400 m) thick with an area of about 5 square miles (13 km2). NASA scientist Eric Rignot provides a narrated tour of Greenland's moving ice sheet. This narrated animation shows the accumulated change in the elevation of the Greenland ice sheet between 2003 and 2012. Until 2007, rate of decrease in ice sheet height in cm per year. Modelling results of the sea-level rise under different warming scenarios. 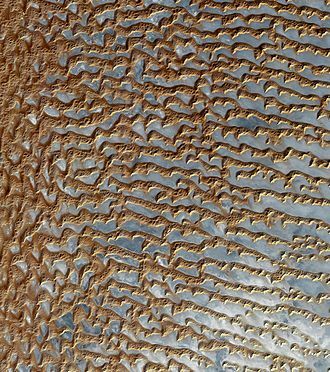 Satellite image of dark melt ponds. 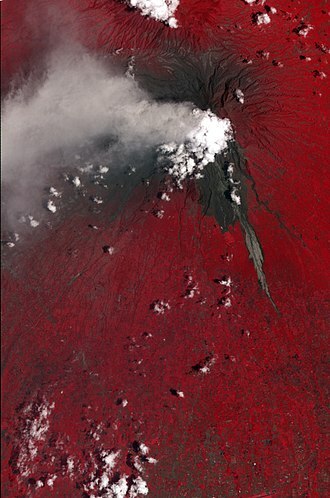 Meltwater creates rivers caused by cryoconite on July 21, 2012. Photo credit: M. Tedesco/CCNY. Two mechanisms have been utilized to explain the change in velocity of the Greenland Ice Sheets outlet glaciers. The first is the enhanced meltwater effect, which relies on additional surface melting, funneled through moulins reaching the glacier base and reducing the friction through a higher basal water pressure. (It should be noted that not all meltwater is retained in the ice sheet and some moulins drain into the ocean, with varying rapidity.) This idea was observed to be the cause of a brief seasonal acceleration of up to 20% on Sermeq Kujalleq in 1998 and 1999 at Swiss Camp. (The acceleration lasted between two and three months and was less than 10% in 1996 and 1997 for example. They offered a conclusion that the "coupling between surface melting and ice-sheet flow provides a mechanism for rapid, large-scale, dynamic responses of ice sheets to climate warming". Examination of recent rapid supra-glacial lake drainage documented short term velocity changes due to such events, but they had little significance to the annual flow of the large outlet glaciers. The second mechanism is a force imbalance at the calving front due to thinning causing a substantial non-linear response. In this case an imbalance of forces at the calving front propagates up-glacier. Thinning causes the glacier to be more buoyant, reducing frictional back forces, as the glacier becomes more afloat at the calving front. The reduced friction due to greater buoyancy allows for an increase in velocity. This is akin to letting off the emergency brake a bit. The reduced resistive force at the calving front is then propagated up-glacier via longitudinal extension because of the backforce reduction. For ice streaming sections of large outlet glaciers (in Antarctica as well) there is always water at the base of the glacier that helps lubricate the flow. If the enhanced meltwater effect is the key, then since meltwater is a seasonal input, velocity would have a seasonal signal and all glaciers would experience this effect. If the force imbalance effect is the key, then the velocity will propagate up-glacier, there will be no seasonal cycle, and the acceleration will be focused on calving glaciers. Helheim Glacier, East Greenland had a stable terminus from the 1970s–2000. In 2001–2005 the glacier retreated 7 km (4.3 mi) and accelerated from 20 to 33 m or 70 to 110 ft/day, while thinning up to 130 meters (430 ft) in the terminus region. Kangerdlugssuaq Glacier, East Greenland had a stable terminus history from 1960 to 2002. The glacier velocity was 13 m or 43 ft/day in the 1990s. In 2004–2005 it accelerated to 36 m or 120 ft/day and thinned by up to 100 m (300 ft) in the lower reach of the glacier. On Sermeq Kujalleq the acceleration began at the calving front and spread up-glacier 20 km (12 mi) in 1997 and up to 55 km (34 mi) inland by 2003. On Helheim the thinning and velocity propagated up-glacier from the calving front. In each case the major outlet glaciers accelerated by at least 50%, much larger than the impact noted due to summer meltwater increase. On each glacier the acceleration was not restricted to the summer, persisting through the winter when surface meltwater is absent. An examination of 32 outlet glaciers in southeast Greenland indicates that the acceleration is significant only for marine-terminating outlet glaciers—glaciers that calve into the ocean. A 2008 study noted that the thinning of the ice sheet is most pronounced for marine-terminating outlet glaciers. As a result of the above, all concluded that the only plausible sequence of events is that increased thinning of the terminus regions, of marine-terminating outlet glaciers, ungrounded the glacier tongues and subsequently allowed acceleration, retreat and further thinning. Warmer temperatures in the region have brought increased precipitation to Greenland, and part of the lost mass has been offset by increased snowfall. However, there are only a small number of weather stations on the island, and though satellite data can examine the entire island, it has only been available since the early 1990s, making the study of trends difficult. It has been observed that there is more precipitation where it is warmer, up to 1.5 meters per year on the southeast flank, and less precipitation or none on the 25–80 percent (depending on the time of year) of the island that is cooler. Melting of surface snow and ice which then flows into moulins, falls and flows to bedrock, lubricates the base of glaciers, and affects the speed of glacial motion. This flow is implicated in accelerating the speed of glaciers and thus the rate of glacial calving. Explanation of accelerated glacial coastward movement and iceberg calving fails to consider another causal factor: increased weight of the central highland ice sheet. As the central ice sheet thickens, which it has for at least seven decades, its greater weight causes more horizontal outward force at the bedrock. This in turn appears to have increased glacial calving at the coasts. Visual evidence for increased central highland ice sheet thickness exists in the numerous aircraft that have made forced landings on the icecap since the 1940s. They landed on the surface and later disappeared under the ice. A notable example is the Lockheed P-38F Lightning World War II fighter plane Glacier Girl that was exhumed from 268 feet of ice in 1992 and restored to flying condition after being buried for over 50 years. It was recovered by members of the Greenland Expedition Society after years of searching and excavation, eventually transported to Kentucky and restored to flying condition. The IPCC Third Assessment Report (2001) estimated the accumulation to 520 ± 26 Gigatonnes of ice per year, runoff and bottom melting to 297±32 Gt/yr and 32±3 Gt/yr, respectively, and iceberg production to 235±33 Gt/yr. On balance, the IPCC estimates −44 ± 53 Gt/yr, which means that the ice sheet may currently be melting. Data from 1996 to 2005 shows that the ice sheet is thinning even faster than supposed by IPCC. According to the study, in 1996 Greenland was losing about 96 km3 or 23.0 cu mi per year in volume from its ice sheet. In 2005, this had increased to about 220 km3 or 52.8 cu mi a year due to rapid thinning near its coasts, while in 2006 it was estimated at 239 km3 (57.3 cu mi) per year. It was estimated that in the year 2007 Greenland ice sheet melting was higher than ever, 592 km3 (142.0 cu mi). Also snowfall was unusually low, which led to unprecedented negative −65 km3 (−15.6 cu mi) Surface Mass Balance. If iceberg calving has happened as an average, Greenland lost 294 Gt of its mass during 2007 (one km3 of ice weighs about 0.9 Gt). The IPCC Fourth Assessment Report (2007) noted, it is hard to measure the mass balance precisely, but most results indicate accelerating mass loss from Greenland during the 1990s up to 2005. Assessment of the data and techniques suggests a mass balance for the Greenland Ice Sheet ranging between growth of 25 Gt/yr and loss of 60 Gt/yr for 1961 to 2003, loss of 50 to 100 Gt/yr for 1993 to 2003 and loss at even higher rates between 2003 and 2005. Analysis of gravity data from GRACE satellites indicates that the Greenland ice sheet lost approximately 2900 Gt (0.1% of its total mass) between March 2002 and September 2012. The mean mass loss rate for 2008–2012 was 367 Gt/year. A paper on Greenland's temperature record shows that the warmest year on record was 1941 while the warmest decades were the 1930s and 1940s. The data used was from stations on the south and west coasts, most of which did not operate continuously the entire study period. While Arctic temperatures have generally increased, there is some discussion concerning the temperatures over Greenland. First of all, Arctic temperatures are highly variable, making it difficult to discern clear trends at a local level. Also, until recently, an area in the North Atlantic including southern Greenland was one of the only areas in the World showing cooling rather than warming in recent decades, but this cooling has now been replaced by strong warming in the period 1979–2005. ^ The timing of the uplift of Greenland is known from the study of planation surfaces formed near sea-level. Greenland has two large planation surfaces: the older Upper Planation Surface and the younger Lower Planation Surface. The Upper Planation Surface has been uplifted 2000 to 3000 masl. since formation and the Lower Planation Surface has been uplifted 500 to 1000 masl. ^ Encyclopædia Britannica. 1999 Multimedia edition. ^ a b c d Climate Change 2001: The Scientific Basis. Contribution of Working Group I to the Third Assessment Report of the Intergovernmental Panel on Climate Change (IPCC) [Houghton, J.T., Y. Ding, D.J. Griggs, M. Noguer, P.J. van der Linden, X. Dai, K. Maskell, and C.A. Johnson (eds. )]Cambridge University Press, Cambridge, United Kingdom and New York, NY, USA, 881pp. , "Archived copy". Archived from the original on 2006-02-10. Retrieved 2006-02-10. CS1 maint: Archived copy as title (link), and . ^ Thiede, JC Jessen, P Knutz, A Kuijpers, N Mikkelsen, N Norgaard-Pedersen, and R Spielhagen (2011) Millions of Years of Greenland Ice Sheet History Recorded in Ocean Sediments. Polarforschung. 80(3):141–159. ^ a b Solgaard, Anne M.; Bonow, Johan M.; Langen, Peter L.; Japsen, Peter; Hvidberg, Christine (2013). "Mountain building and the initiation of the Greenland Ice Sheet". Palaeogeography, Palaeoclimatology, Palaeoecology. 392: 161–176. doi:10.1016/j.palaeo.2013.09.019. ^ a b "The Secrets in Greenland's Ice Sheet". The New York Times. 2015. ^ "Glacial Earthquakes Point to Rising Temperatures in Greenland – Lamont-Doherty Earth Observatory News". columbia.edu. ^ a b "BBC NEWS – Science/Nature – Greenland melt 'speeding up'". bbc.co.uk. 2006-08-11. ^ Small Glaciers Account for Most of Greenland's Recent Ice Loss Newswise, Retrieved on September 15, 2008. ^ NEEM community members; Dahl-Jensen, D.; Albert, M. R.; Aldahan, A.; Azuma, N.; Balslev-Clausen, D.; Baumgartner, M.; Berggren, A. -M.; Bigler, M.; Binder, T.; Blunier, T.; Bourgeois, J. C.; Brook, E. J.; Buchardt, S. L.; Buizert, C.; Capron, E.; Chappellaz, J.; Chung, J.; Clausen, H. B.; Cvijanovic, I.; Davies, S. M.; Ditlevsen, P.; Eicher, O.; Fischer, H.; Fisher, D. A.; Fleet, L. G.; Gfeller, G.; Gkinis, V.; Gogineni, S.; et al. (January 24, 2013). "Eemian interglacial reconstructed from a Greenland folded ice core". Nature. 493 (7433): 489–494. Bibcode:2013Natur.493..489N. doi:10.1038/nature11789. PMID 23344358. ^ "Greenland enters melt mode". Science News. 2013-09-23. ^ Wall, Tim (2017-05-10). "Greenland Hits 97 Percent Meltdown in July". Discovery News. ^ "NASA Made Up 150 Year Melt Cycle". Daily Kos. ^ Meese, D. A.; Gow, A. J.; Grootes, P.; Stuiver, M.; Mayewski, P. A.; Zielinski, G. A.; Ram, M.; Taylor, K. C.; Waddington, E. D. (1994). "The Accumulation Record from the GISP2 Core as an Indicator of Climate Change Throughout the Holocene" (PDF). Sciencemag.org. 266 (5191): 1680–1682. doi:10.1126/science.266.5191.1680. PMID 17775628. ^ Statham, Peter J.; Skidmore, Mark; Tranter, Martyn (2008-09-01). "Inputs of glacially derived dissolved and colloidal iron to the coastal ocean and implications for primary productivity". Global Biogeochemical Cycles. 22 (3): GB3013. Bibcode:2008GBioC..22.3013S. doi:10.1029/2007GB003106. ISSN 1944-9224. ^ "Glaciers Contribute Significant Iron to North Atlantic Ocean" (news release). Woods Hole Oceanographic Institution. March 10, 2013. Retrieved March 18, 2013. ^ Hopwood, Mark James; Connelly, Douglas Patrick; Arendt, Kristine Engel; Juul-Pedersen, Thomas; Stinchcombe, Mark; Meire, Lorenz; Esposito, Mario; Krishna, Ram (2016-01-01). "Seasonal changes in Fe along a glaciated Greenlandic fjord". Marine Biogeochemistry. 4: 15. Bibcode:2016FrEaS...4...15H. doi:10.3389/feart.2016.00015. ^ Martin, John H.; Fitzwater, Steve E.; Gordon, R. Michael (1990-03-01). "Iron deficiency limits phytoplankton growth in Antarctic waters". Global Biogeochemical Cycles. 4 (1): 5–12. Bibcode:1990GBioC...4....5M. doi:10.1029/GB004i001p00005. ISSN 1944-9224. ^ Nielsdóttir, Maria C.; Moore, Christopher Mark; Sanders, Richard; Hinz, Daria J.; Achterberg, Eric P. (2009-09-01). "Iron limitation of the postbloom phytoplankton communities in the Iceland Basin" (PDF). Global Biogeochemical Cycles. 23 (3): GB3001. Bibcode:2009GBioC..23.3001N. doi:10.1029/2008GB003410. ISSN 1944-9224. ^ Arendt, Kristine Engel; Nielsen, Torkel Gissel; Rysgaard, Sren; Tnnesson, Kajsa (2010-02-22). "Differences in plankton community structure along the Godthåbsfjord, from the Greenland Ice Sheet to offshore waters". Marine Ecology Progress Series. 401: 49–62. Bibcode:2010MEPS..401...49E. doi:10.3354/meps08368. ^ Bennartz, R.; Shupe, M. D.; Turner, D. D.; Walden, V. P.; Steffen, K.; Cox, C. J.; Kulie, M. S.; Miller, N. B.; Pettersen, C. (2013). "July 2012 Greenland melt extent enhanced by low-level liquid clouds". Nature. 496 (7443): 83–86. Bibcode:2013Natur.496...83B. doi:10.1038/nature12002. PMID 23552947. ^ Van Tricht, K.; Lhermitte, S.; Lenaerts, J. T. M.; Gorodetskaya, I. V.; L’Ecuyer, T. S.; Noël, B.; van den Broeke, M. R.; Turner, D. D.; van Lipzig, N. P. M. (2016-01-12). "Clouds enhance Greenland ice sheet meltwater runoff". Nature Communications. 7: 10266. Bibcode:2016NatCo...710266V. doi:10.1038/ncomms10266. PMC 4729937. PMID 26756470. ^ "Melting Greenland ice sheet may affect global ocean circulation, future climate". Phys.org. 2016. ^ Hopwood, M. J.; Carroll, D.; Browning, T. J.; Meire, L.; Mortensen, J.; Krisch, S.; Achterberg, E. P. (14 August 2018). "Non-linear response of summertime marine productivity to increased meltwater discharge around Greenland". Nature Communications. 9 (1): 3256. doi:10.1038/s41467-018-05488-8. PMC 6092443. PMID 30108210. ^ "Images Show Breakup of Two of Greenland's Largest Glaciers, Predict Disintegration in Near Future". NASA Earth Observatory. August 20, 2008. Retrieved 2008-08-31. ^ "Huge ice island breaks from Greenland glacier". BBC News. 2010-08-07. ^ "Surface Melt-Induced Acceleration of Greenland Ice-Sheet Flow by Zwally et al., "
^ "Thomas R.H (2004), Force-perturbation analysis of recent thinning and acceleration of Jakobshavn Isbrae, Greenland, Journal of Glaciology 50 (168): 57–66. " ^ Thomas, R. H. Abdalati W; Frederick, E; Krabill, WB; Manizade, S; Steffen, K (2003). "Investigation of surface melting and dynamic thinning on Jakobshavn Isbrae, Greenland". Journal of Glaciology. 49 (165): 231–239. doi:10.3189/172756503781830764. ^ Joughin, I; Abdalati, W; Fahnestock, M (December 2004). "Large fluctuations in speed on Greenlands Jakobshavn Isbræ glacier". Nature. 432 (7017): 608–610. doi:10.1038/nature03130. PMID 15577906. ^ a b "Rates of southeast Greenland ice volume loss...by Howat et al". AGU. ^ "Arctic Report Card: Update for 2012; Greenland Ice Sheet". ^ see Arctic Climate Impact Assessment (2004) and IPCC Second Assessment Report, among others. ^ IPCC, 2007. Trenberth, K.E., P.D. Jones, P. Ambenje, R. Bojariu, D. Easterling, A. Klein Tank, D. Parker, F. Rahimzadeh, J.A. Renwick, M. Rusticucci, B. Soden and P. Zhai, 2007: Observations: Surface and Atmospheric Climate Change. In: Climate Change 2007: The Physical Science Basis. Contribution of Working Group I to the Fourth Assessment Report of the Intergovernmental Panel on Climate Change [Solomon, S., D. Qin, M. Manning, Z. Chen, M. Marquis, K.B. Averyt, M. Tignor and H.L. Miller (eds.)]. Cambridge University Press, Cambridge, United Kingdom and New York, NY, USA. Geological Survey of Denmark and Greenland (GEUS) GEUS has much scientific material on Greenland. Emporia State University – James S. Aber Lecture 2: Modern Glaciers and Ice Sheets. GRACE ice mass measurement: "Recent Land Ice Mass Flux from SpaceborneGravimetry"
Jakobshavn Glacier, known as Sermeq Kujalleq and the Jakobshavn Isbræ, is a large outlet glacier in West Greenland. It is located near the Greenlandic town of Ilulissat and ends at the sea in the Ilulissat Icefjord, Jakobshavn Glacier drains 6. 5% of the Greenland ice sheet and produces around 10% of all Greenland icebergs. Some 35 billion tonnes of icebergs calve off and pass out of the every year. Studied for over 250 years, Jakobshavn Glacier has helped develop our understanding of climate change, Ilulissat Icefjord was declared a UNESCO World Heritage Site in 2004. Jakobshavn has been a name used for this glacier in scientific literature since 1853 when Danish geologist Hinrich Johannes Rink referred to it as Jakobshavn Isstrøm and it is sometimes referred to in the international scientific literature as Jakobshavn Isbræ glacier. It is known by the anglicised version, Jakobshavn Glacier. The local name for glacier is Sermeq Kujalleq, where sermeq is Greenlandic for glacier. It lies south of the town Ilulissat, uNESCOs World Heritage Site website uses this name, in connection with mention of the Ilulissat Icefjord world heritage site, which includes the downstream end of the glacier. There is evidence that people have inhabited the area around the glacier for up to 4000 years, the recently abandoned settlement of Sermermiut lies just to the north of the glacier, much nearer than Ilulissat. The glacier is referred to as Ilulissat Glacier. This form simply replaces Jakobshavn with Ilulissat because of the change in the name of the town, the speed of Jakobshavn Glacier varied between 5,700 and 12,600 metres per year between 1992 and 2003. 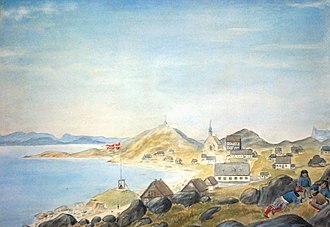 Jakobshavn Isbrae, retreated 30 km from 1850–1964, followed by a front for 35 years. Jakobshavn has the highest mass flux of any glacier draining the Greenland Ice Sheet, the glacier terminus region had a consistent velocity of 20 metres per day, from season to season and year to year, the glacier seemed to be in balance from 1955-1985. After 1997 the glacier began to accelerate and thin rapidly, reaching a velocity of 34 metres per day in the terminus region. It thinned at a rate of up to 15 metres per year, Jakobshavn has afterwards slowed to near its pre-1997 speed, with the terminus retreat still occurring. An ice sheet is a mass of glacier ice that covers surrounding terrain and is greater than 50,000 km2, thus known as continental glacier. Ice sheets are bigger than ice shelves or alpine glaciers, masses of ice covering less than 50,000 km2 are termed an ice cap. An ice cap will typically feed a series of glaciers around its periphery, although the surface is cold, the base of an ice sheet is generally warmer due to geothermal heat. In places, melting occurs and the melt-water lubricates the ice sheet so that it more rapidly. This process produces fast-flowing channels in the ice sheet — these are ice streams, the present-day polar ice sheets are relatively young in geological terms. The Antarctic Ice Sheet first formed as an ice cap in the early Oligocene, but retreating and advancing many times until the Pliocene. The Greenland ice sheet did not develop at all until the late Pliocene and this had the unusual effect of allowing fossils of plants that once grew on present-day Greenland to be much better preserved than with the slowly forming Antarctic ice sheet. 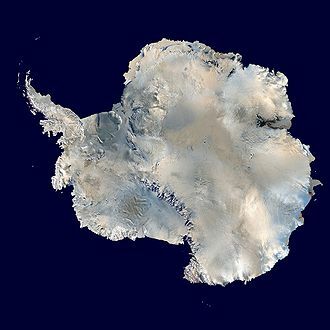 The Antarctic ice sheet is the largest single mass of ice on Earth and it covers an area of almost 14 million km2 and contains 30 million km3 of ice. Around 90% of the water on the Earths surface is held in the ice sheet. The continent-wide average surface temperature trend of Antarctica is positive and significant at >0.05 °C/decade since 1957, the Antarctic ice sheet is divided by the Transantarctic Mountains into two unequal sections called the East Antarctic ice sheet and the smaller West Antarctic Ice Sheet. The EAIS rests on a land mass but the bed of the WAIS is, in places. It would be seabed if the ice sheet were not there, the WAIS is classified as a marine-based ice sheet, meaning that its bed lies below sea level and its edges flow into floating ice shelves. The WAIS is bounded by the Ross Ice Shelf, the Ronne Ice Shelf, the Greenland ice sheet occupies about 82% of the surface of Greenland, and if melted would cause sea levels to rise by 7.2 metres. Estimated changes in the mass of Greenlands ice sheet suggest it is melting at a rate of about 239 cubic kilometres per year and these measurements came from NASAs Gravity Recovery and Climate Experiment satellite, launched in 2002, as reported by BBC News in August 2006. The Eemian was the interglacial period which began about 130,000 years ago and ended about 115,000 years ago. It corresponds to Marine Isotope Stage 5e, although sometimes referred to as the last interglacial, it was the second-to-latest interglacial period of the current Ice Age, the most recent being the Holocene which extends to the present day. The prevailing Eemian climate is believed to have been warmer than that of the Holocene, the Eemian is known as the Ipswichian in the UK, the Mikulin interglacial in Russia, the Valdivia interglacial in Chile and the Riss-Würm interglacial in the Alps. Depending on how a specific publication defines the Sangamonian Stage of North America, the Eemian climate is believed to have been about as stable as that of the Holocene. The warmest peak of the Eemian was around 125,000 years ago, hardwood trees such as hazel and oak grew as far north as Oulu, Finland. At the peak of the Eemian, the Northern Hemisphere winters were generally warmer and wetter than now, the hippopotamus was distributed as far north as the rivers Rhine and Thames. Trees grew as far north as southern Baffin Island in the Canadian Arctic Archipelago, the prairie-forest boundary in the Great Plains of the United States lay further west near Lubbock, whereas the current boundary is near Dallas, Texas. Kaspar et al. performed a comparison of a general circulation model with reconstructed Eemian temperatures for Europe. Central Europe was found to be 1–2 °C warmer than present, south of the Alps, the model generally reproduces these observations, leading them to conclude that these factors are enough to explain the Eemian temperatures. Because of the sea level drop since the Eemian, exposed fossil coral reefs are common in the tropics, especially in the Caribbean and these reefs often contain internal erosion surfaces showing significant sea level instability during the Eemian. 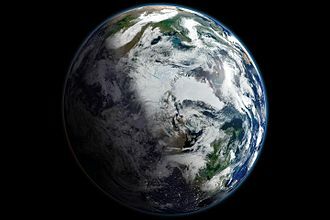 A2007 study found evidence that the Greenland ice core site Dye 3 was glaciated during the Eemian, scandinavia was an island due to the inundation of vast areas of northern Europe and the West Siberian Plain. The Eemian Stage was first recognized from boreholes in the area of the city of Amersfoort, Netherlands and he named the beds Système Eémien, after the river Eem on which Amersfoort is located. Harting noticed the marine molluscan assemblages to be different from the modern fauna of the North Sea. Many species from the Eemian layers nowadays show a more southern distribution, ranging from South of the Strait of Dover to Portugal. More information on the molluscan assemblages is given by Lorié, since their discovery, Eemian beds in the Netherlands have mainly been recognized by their marine molluscan content combined with their stratigraphical position and other palaeontology. The marine beds there are often underlain by tills that are considered to date from the Saalian, in contrast to e. g. the deposits in Denmark, the Eemian deposits in the type area have never been found overlain by tills, nor in ice-pushed positions. Van Voorthuysen described the foraminifera from the site, whereas Zagwijn published the palynology. Reliable global records of climate only began in the 1880s, and proxies provide the only means for scientists to determine climatic patterns before record-keeping began. Examples of proxies include ice cores, tree rings, sub-fossil pollen, corals and ocean sediments, and carbonate speleothems. The character of deposition or rate of growth of the material has been influenced by the climatic conditions of the time in which they were laid down or grew. Chemical traces produced by climatic changes, such as quantities of particular isotopes, to produce the most precise results, systematic cross-verification between proxy indicators is necessary for accuracy in readings and record-keeping. Proxies can be combined to produce temperature reconstructions longer than the temperature record. The distribution of records, just like the instrumental record, is not at all uniform. In science, it is necessary to study a variable which cannot be measured directly. This can be done by methods, in which a variable which correlates with the variable of interest is measured. Proxy methods are of use in the study of the past climate. The longer history of the proxy is used to reconstruct temperature from earlier periods, Ice cores are cylindrical samples from within ice sheets in the Greenland and North American regions. First attempts of extraction occurred in 1956 as part of the International Geophysical Year and their machinery could drill through 15–20 feet of ice in 40–50 minutes. From 1300 to 3,000 feet in depth, core samples were 4 ¼ inches in diameter and 10 to 20 feet long, deeper samples of 15 to 20 feet long were not uncommon. Every subsequent drilling team improves their method with each new effort, presence of water molecule isotopic compositions of 16O and 18O in an ice core help determine past temperatures and snow accumulations. The heavier isotope more readily as temperatures decrease and falls as precipitation. The farther north elevated levels of an 18O isotope are detected signals a warming over time, in addition to oxygen isotopes, water contains hydrogen isotopes - 1H and 2H, usually referred to as H and D - that are used for temperature proxies. Paleoclimatology is the study of changes in climate taken on the scale of the entire history of Earth. It uses the records to determine the past states of the Earths various climate regions and he noted that the loess deposits at Timaru in the South Island recorded changes in climate, he called the loess a climate register. Paleoclimatologists employ a variety of techniques to deduce ancient climates. Mountain glaciers and the polar ice caps/ice sheets provide much data in paleoclimatology, ice-coring projects in the ice caps of Greenland and Antarctica have yielded data going back several hundred thousand years, over 800,000 years in the case of the EPICA project. Air trapped within fallen snow becomes encased in tiny bubbles as the snow is compressed into ice in the glacier under the weight of years snow. The trapped air has proven a valuable source for direct measurement of the composition of air from the time the ice was formed. Layering can be observed because of seasonal pauses in ice accumulation and can be used to establish chronology, changes in the layering thickness can be used to determine changes in precipitation or temperature. Oxygen-18 quantity changes in ice layers represent changes in ocean surface temperature. Water molecules containing the heavier O-18 evaporate at a higher temperature than water molecules containing the normal Oxygen-16 isotope, the ratio of O-18 to O-16 will be higher as temperature increases. 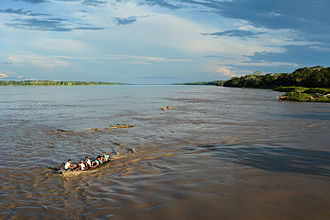 It depends on factors such as the waters salinity. Various cycles in those isotope ratios have been detected, pollen has been observed in the ice cores and can be used to understand which plants were present as the layer formed. Pollen is produced in abundance and its distribution is well understood. A pollen count for a layer can be produced by observing the total amount of pollen categorized by type in a controlled sample of that layer. Changes in plant frequency over time can be plotted through statistical analysis of pollen counts in the core, knowing which plants were present leads to an understanding of precipitation and temperature, and types of fauna present. Palynology includes the study of pollen for these purposes, volcanic ash is contained in some layers, and can be used to establish the time of the layers formation. Depth contours, shoreline configurations, and interactions with other currents influence a currents direction and strength. Therefore ocean currents are primarily horizontal water movements, Ocean currents flow for great distances, and together, create the global conveyor belt which plays a dominant role in determining the climate of many of the Earth’s regions. More specifically, ocean currents influence the temperature of the regions through which they travel, for example, warm currents traveling along more temperate coasts increase the temperature of the area by warming the sea breezes that blow over them. Perhaps the most striking example is the Gulf Stream, which makes northwest Europe much more temperate than any region at the same latitude. Another example is Lima, Peru where the climate is cooler than the tropical latitudes in which the area is located, in these wind driven currents, the Ekman spiral effect results in the currents flowing at an angle to the driving winds. In addition, the areas of ocean currents move somewhat with the seasons. Deep ocean basins generally have a surface current, in that the eastern equatorward-flowing branch is broad. 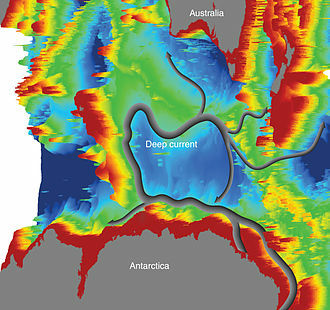 These western boundary currents are a consequence of the rotation of the Earth, Deep ocean currents are driven by density and temperature gradients. Thermohaline circulation is known as the oceans conveyor belt. These currents, called submarine rivers, flow under the surface of the ocean and are hidden from immediate detection, where significant vertical movement of ocean currents is observed, this is known as upwelling and downwelling. Deep ocean currents are currently being researched using a fleet of robots called Argo. The South Equatorial Currents of the Atlantic and Pacific straddle the equator, though the Coriolis effect is weak near the equator, water moving in the currents on either side of the equator is deflected slightly poleward and replaced by deeper water. Thus, equatorial upwelling occurs in these westward flowing equatorial surface currents, upwelling is an important process because this water from within and below the pycnocline is often rich in nutrients and greatly benefits the growth of marine organisms. James Edward Hansen is an American adjunct professor in the Department of Earth and Environmental Sciences at Columbia University. However, even he wrote the future balance of forcings is likely to shift toward dominance of CO2 over aerosols Hansen was born in Denison, Iowa to James Ivan Hansen and Gladys Ray Hansen. He was trained in physics and astronomy in the science program of James Van Allen at the University of Iowa. He obtained a B. A. in Physics and Mathematics with highest distinction in 1963, an M. S. in Astronomy in 1965, Hansen began work at the Goddard Institute for Space Studies in 1967. After graduate school, Hansen continued his work with radiative transfer models, he applied and refined these models to understand the Earths atmosphere, in particular, the effects that aerosols and trace gases have on Earths climate. Hansens development and use of climate models has contributed to the further understanding of the Earths climate. In 2009 his first book, Storms of My Grandchildren, was published, in 2012 he presented a 2012 TED Talk, Why I must speak out about climate change. From 1981 to 2013, he was the head of the NASA Goddard Institute for Space Studies in New York City, as of 2014, Hansen directs the Program on Climate Science and Solutions at Columbia Universitys Earth Institute. The program is working to continue to connect the dots from advancing basic science to promoting public awareness to advocating policy actions. As a college student at the University of Iowa, Hansen was attracted to science, a decade later, his focus shifted to planetary research that involved trying to understand the climate change on earth that will result from anthropogenic changes of the atmospheric composition. Because of the ability of satellites to monitor the entire globe, they may be one of the most effective ways to monitor and his other interests include the development of global circulation models to help understand the observed climate trends, and diagnosing human impacts on climate. In the late 1960s and early 1970s, following his Ph. D. dissertation, Venus has a high brightness temperature in the radio frequencies compared to the infrared. Hansen proposed that the hot surface was the result of aerosols trapping the internal energy of the planet, Hansen continued his study of Venus by looking at the composition of its clouds. He looked at the near-infrared reflectivity of ice clouds, compared them to observations of Venus and he was able to use a radiative transfer model to establish an upper limit to the size of the ice particles if the clouds were actually made of ice. Evidence published in the early 1980s showed that the clouds consist mainly of sulfur dioxide, by 1974, the composition of Venus clouds had not yet been determined, with many scientists proposing a wide variety of compounds, including liquid water and aqueous solutions of ferrous chloride. Kiyoshi Kawabata and Hansen expanded upon this work by looking at the variation of polarization on Venus and they found that the visible clouds are a diffuse haze rather than a thick cloud, confirming the same results obtained from transits across the sun. The Pioneer Venus project was launched in May 1978 and reached Venus late that same year, Hansen collaborated with Larry Travis and other colleagues in a 1979 Science article that reported on the development and variability of clouds in the ultraviolet spectrum. An Inuit hunting boat in southern Melville Bay. Late morning fog and icebergs in the background. View of two ships in Melville Bay by Edward Augustus Inglefield. 1869 photograph of a steamer and a party of hunters in Melville Bay. Venus is surrounded by a thick atmosphere composed mainly of carbon dioxide and nitrogen, and its clouds are sulfuric acid. The thickness of the atmosphere initially made it difficult to determine why the surface was so hot. A typical automated airport weather station which records the routine hourly weather observations of temperature, weather type, wind, sky condition, and visibility. These surface stations are located around the world, and are used to derive a global temperature. The incomplete combustion of biomass during the Yellowstone fires of 1988 near the Snake River introduced a large quantity of black carbon particles into the atmosphere. Hansen has warned that low-lying coastal areas such as Florida (seen here), East Anglia, the Netherlands, oceanic islands and Bangladesh are vulnerable to sea levels rising. Dust blown off the Alaskan coast into the North Pacific. Currents in the North Pacific Ocean.